Warts in animals are caused by viruses similar to those that cause warts in people. Papillomas are spread between animals by direct contact. 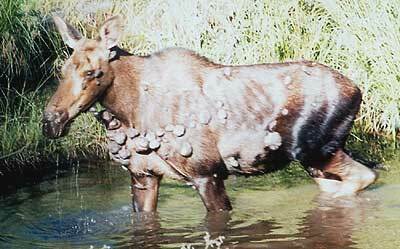 Warts are found on the skin of moose or caribou throughout Alaska. They are most common in animals younger than 2 years old. What are the signs of warts? Affected animals are usually in good body condition. Warts are often found on the head but can occur on other parts of the body. In caribou and moose, the warts are dark lumps that vary in size from 1/3 to 6 inches. There may be only one or many and the surface may be rough or smooth. It is extremely rare but not impossible to get a skin lesion from infected animals. Meat from infected animals is suitable for human consumption. Trim off parts containing warts. To report an occurrence or to submit a sample for identification/analysis, contact the DWC Wildlife Disease Surveillance reporting hotline 907-328-8354, send an email to dfg.dwc.vet@alaska.gov or visit your local ADF&G office.